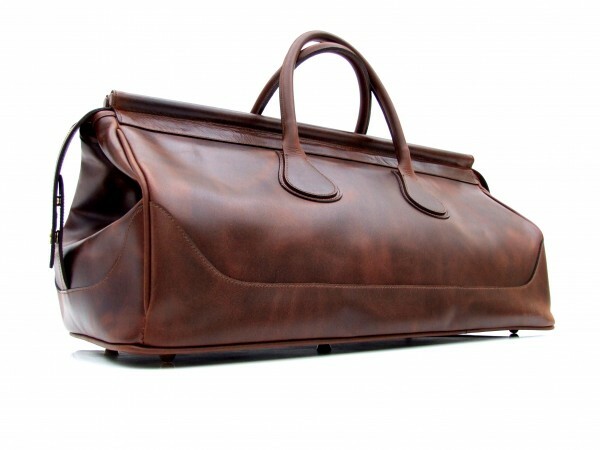 There is a surprising lack of good, mid-market leather products and bags out there. By mid-market I mean those stitched by machine rather than by hand (which adds considerably to the price) but otherwise using the highest quality leathers and manufacturing. Bown Bags is a tiny operator I have written about before; there’s The Merchant Fox bags recently featured on The Rake; Bill Amberg, of course; and I’ve written about a few others, including Lotuff & Clegg in the US. Added to the list of those I have personal experience of – and therefore where I feel I can offer a first-hand review – is Hype luggage, started recently by Paul Holmes following many years working in Asia on large-scale production. Sick of the cutting of corners, and some industrial-level theft, Paul returned to England to found a company producing a higher grade of bag. Hype bags feature: machine stitching, as I said, though with some handwork at points; a mix of veg-tanned and chrome-tanned leathers, though I have to say I prefer the former; RiRi zips; suede linings throughout, except on pieces like the iPad cover above, which uses a lovely sheep’s wool; nice attention to detail around stress points like handles. Overall, the production standard is very high. All end threads are pulled through to the inside of the bag, knotted off and secured with adhesive; some producers just leave those hanging, and they will eventually work through. As with the difference between a suede and fabric lining, you won’t notice the difference for 10 years, but you will notice. I liked the iPad case I saw, which is pictured above. The leather is nice, with a pleasing grain and natural variegation. My only quibble is with the finishing at the point the edges split for the opening (below). The inking is rather rough, varies in thickness and the edge waves slightly. It will make no practical difference to the longevity of the case, but it could be neater. Mid-market bags like those from Hype tend to be in the £500-£1000 range. Hype’s leather holdall is £890 and the iPad cover is £150. Top-end bags (Hermès, Alfred Dunhill, Asprey etc) are in the thousands. You can buy Hype bags through its site or the handful of retailers in the UK and US. You can follow the discussion on Hype luggage: Review by entering your email address in the box below. You will then receive an email every time a new comment is added. These will also contain a link to a page where you can stop the alerts, and remove all of your related data from the site. What’s even more rare are quality, mid-market hard sided suitcases. Can you recommend any manufacturers? I’d like something that looks like it was made to carry clothes, not anti-aircraft guns. Rimowa? Perhaps the Salsa line made of polycarbonate if you don’t fancy the aluminium. Also Simon, what were you up to in front of Cleverley this lunchtime? I was catching up with George, and talking about stretching my first bespoke Cleverleys a little. Enjoy your blog thank you…question on the ipad cover above. I have an ipad 3 with a logitec thin keyboard cover, would you know if this would fit into the sleeve? Many thanks from the other side of the world – Tasmania, Australia.